Hello fellow book lovers! I can't believe Chantel's THIRD YA book is coming out this fall! It seems like just yesterday I was asking for bloggers to sign up for the RULE OF THIRDS tour, time, indeed, flies by! After two drama-filled weeks in Manhattan, Pippa Greene is back. Despite a romantic reunion with boyfriend Dylan, she can’t seem to shake the emotional aftermath of New York. As she navigates parental drama at home and her charged dynamic with Ben Baxter at school, Pippa finds that Dylan is more wrapped up in his post-high-school life of bands, shows, and new friends than in their relationship. Will it survive? This is a terrific YA Contemporary series that you'll love! ECW Press is looking for bloggers, whom are interested in participating in the blog tour for LEADING LINES, which is the 3rd book in the Pippa Greene series. If you're new to the wonderful and exciting Pippa, here are links to RoT and DoF. If you're a book blogger and interested in participating in the blog tour for LEADING LINES please send me an email at bookingitwithhayleyg (AT) gmail (DOT) com with a link to your blog and your blogger stats, what post you'd be interested in (i.e. interview, spotlight, review, guest post etc.) also please indicate if you've read books 1 and 2 or are new to the series. 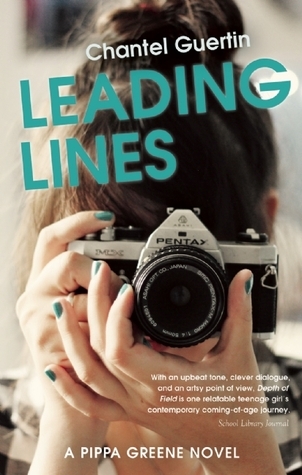 Please indicate email with LEADING LINES TOUR in the subject line. Please note: I will be passing along the information you send me to my contact at ECW Press and they will confirm whether or not you'll be able to participate in the tour - but the more the merrier! :).